Sanilac Steel, Inc. was formed in 1967 by James O’Morrow Sr., Alan Loding, Keith Jensen and Paul Jensen. Sanilac Steel bought out Weaver Steel and has remained at its original location of 2487 S Van Dyke Rd, Marlette, MI 48453. In the early days they performed a wide variety of steel construction work including steel joists, steel beams and columns. They had even built many small bridges in the area. Today, Sanilac Steel fabricates structural steel for commercial, industrial and municipal building projects all over the state of Michigan. They also erect their own fabricated structural steel on site with a full crew of iron-workers and equipment including cranes, portable welding machines and rough terrain material handling equipment. Currently, James O’Morrow Sr. is the majority owner of Sanilac Steel and has been for the past several years. James bought the other owners out during the decade of the 90’s. James’ son, James Jr., is a minority owner and is currently running the day to day activities of the company. 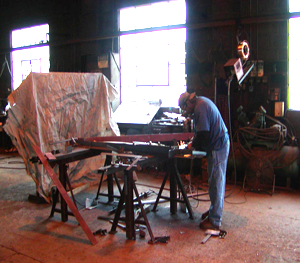 All of Sanilac Steel’s employees are dedicated and experienced with most of them being with the company for many years. They have worked on projects from Michigan’s Upper Peninsula to the southern boarder. Buildings such as Alpena Hospital’s Oncology Center, Port Huron Schools Performing Arts Center, Sault St Marie Tribe Casino and Hotel at St Ignace, Tower Automotive Press Line in Elkton, Mt Pleasant Fire and Police Center and many, many more. They also offer crane rentals, retail steel sales, steel design and engineering, miscellaneous portable welding, even delivery and set up of support beams for houses.